Financially straitened and on the path to spinsterhood, Venetia Milton thought her stay at the remote, ramshackle Arcane House would be a once-in-a-lifetime opportunity to engineer her own ravishment. She was there to photograph the artifacts collected by a highly secretive organization, founded two centuries earlier by an alchemist. And the alchemist's descendant--her employer--Gabriel Jones-has the eyes of a sorcerer. But despite Venetia's intent to seduce Mr. Jones and move on, she is shattered upon her return home to read in the press of his violent demise. Using the sizable fee Mr. Jones paid her, Venetia establishes a new life, opening a gallery in London. Of course, posing as a respectable widow makes it easier to do business, so--in a private tribute to her lost, only lover--she assumes the identity of "Mrs. Jones." Her romantic whim, however, will cause unexpected trouble. For one thing, Mr. Jones is about to stride, living and breathing, back into Venetia's life. And the two share more than a passionate memory--indeed, they are bonded by a highly unusual sort of vision, one that goes far beyond Venetia's abilities as a photographer. They also share a terrible threat, for someone has stolen a centuries-old notebook from Arcane House that contains a formula believed to enhance psychic powers of the kind Gabriel and Venetia possess. And the thief wants to know more; even if he must kill the keeper of the Arcane Society's treasures, or the photographer who catalogued them, to obtain such knowledge. I sat on this review for a few days wondering what to say about Second Sight only to realize that I really could not think of anything else to say about it at all that would be useful in a review. 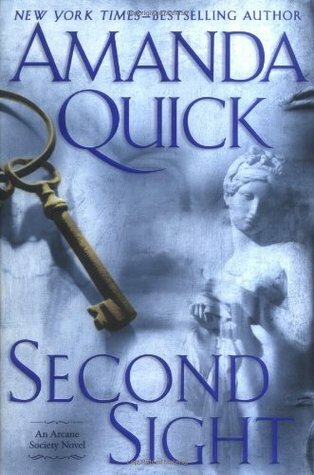 Because, unlike the other two Amanda Quick books I've already read, this one wasn't really all that memorable. My only notion is that I enjoyed it while I was reading it and it captured my attention enough for me to breeze through the entire story--conflict, romance, and all. I really did, immensely enjoy the book a lot, even in spite of all of the glaring flaws that I probably would have condemned many other books for. The romance, I've found, is pretty predictable and formulaic with a specific Amanda Quick signature to it (yes, I know I've only read two other books by her, but the similarities are hard to ignore). The criminal thriller portions are actually pretty good, and I DO like the paranormal aspects; however, a lot of it still doesn't make much sense, to be honest. I like that the author has created her own historical, paranormal world... but I would like a little more insight into it. While I get Venetia's paranormal ability to see auras (her second sight--titular reference alert! ), I'm not entirely sure I understand what Gabriel's paranormal ability entails. Another aspect I find likable are the characters. I do believe that Amanda Quick has the ability to create very readily relatable and likable characters, whether they are just the housekeeper, the butler, the younger siblings, or an eccentric acquaintance who practices cross-dressing. There are stories behind these people and I found myself wondering if those stories will come into the forefront with later books, or other books outside of the series. And I DID like Venetia and Gabriel, even if their romance was a bit lukewarm. They make a pretty good investigating team, though--something that seems to carry through all the Amanda Quick (or Jayne Castle) books I've read so far. That's definitely a plus. I just find that the romances in the Amanda Quick historicals don't carry as much chemistry as the futuristic Jayne Castle books... which is strange seeing as how the books are essentially written by the same author, even if she adopts a different pseudonym (and maybe a different persona?). Is this a historical romance thing? Maybe I'm just not as familiar with historicals since I've only recently wandered into the genre. Mainly, I'm finding Amanda Quick's books highly addictive (although, to be honest, I'm really finding her futuristic stories of the Harmony series, written as Jayne Castle, even more entertaining and addictive). And so this is one author I will definitely continue to follow. One of the main reasons I am interested in the Arcane Society series, though, is I'm very curious to find out how Jayne Ann Krentz manages to juggle the series between a historical setting and a contemporary setting, and how she will be able to connect them as each book progresses. I'm also extra curious to see how she manages to later incorporate the futuristic Harmony series as a crossover into Arcane Society. So I hope that the books continue to be mysteriously addictive and enjoyable. What I've read of Jayne Ann Krentz so far, whether as Amanda Quick or Jayne Castle, I'm finding fun, easy, and entertaining. Certain aspects of her books (story, progression, world building) are kind of shaky, but they are written well and I like them. And in the end, as I dare to repeat words I've used time and time again, that is all that really matters to me--that I like what I've read and I had fun reading it.